Piano Solo. Composed by Charles Marie Widor (1844-1937). Edited by Felix Friedrich and Irmtraut Friedrich. Sheet music. Piano. Classical. Softcover. 46 pages. Schott Music #ED20415. Published by Schott Music (HL.49017730). 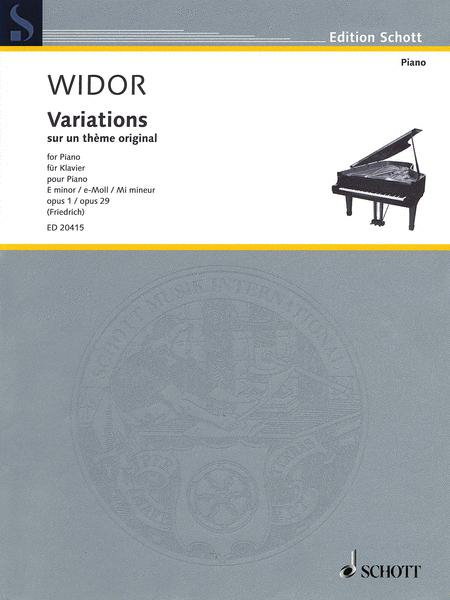 Opus 1 shows that Widor takes the tonal language of J. S. Bach as a starting point, yet gives his cycle of variations, which is reminiscent of the Goldberg Variations, its own romantic expression. In 1876 he revised the variations and published them as opus 29. Our carefully edited new edition contains both versions (Op. 1 and Op. 29).